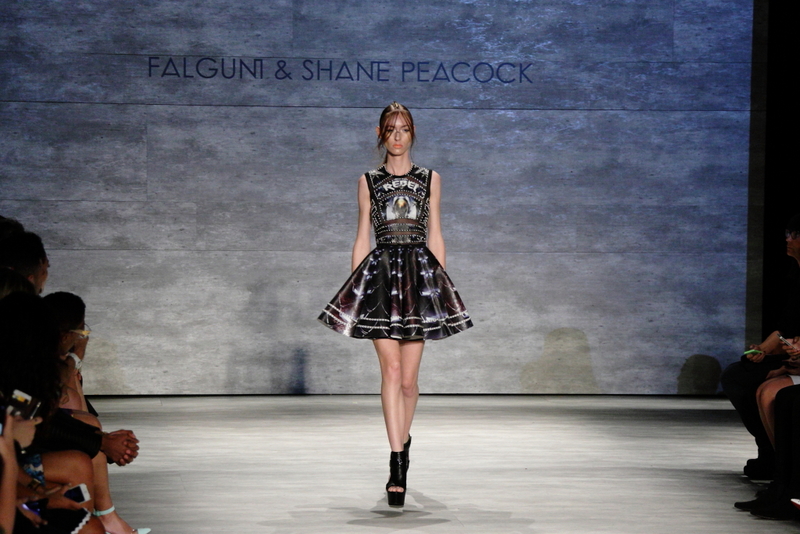 I have been following Falguni & Shane Peacock since their first show at New York’s Fashion Week. Back then, many of their pieces shined, literally, with tiny bulbs lighting up the looks. They still shine – minus the electrics – because they are, quite simply, gorgeous. You can see the influence of their home country in every one of the Mumbai design duo’s looks, but describing them as “Bollywood” would not do them justice. At once futuristic and timely, their devotion to sequins, mirrors and their trademark feathers make each piece showy, yet somehow so wearable. It also makes them a favorite of celebs from Brittney Spears and Fergie to Katy Perry and Lady Gaga. For Spring/Summer 2015, they called their collection “Metamorphosis”. It was filled with bold prints and stunning colors: deep blues, corals and bright pinks. Metallics were the real order of the day, with bright silvers and golds threading through almost every piece. There was so much texture in this collection, including embellished sheer net in black and off-white. It was truly stunning. One off-white, sheer skirt with a bra top was a standout, as was a magnificent black, nearly backless sequined gown. You can always expect something from Falguni & Shane Peacock that you won’t see anywhere else on the runway. That’s what keeps their fans, and me, coming back, season after season. This entry was posted in Fashion and tagged Anton Brookes, Debora Fougere, Falguni & Shane Peacock, fashion, Lincoln Center, MBFW Spring/Summer 2015, mercedes benz fashion week, New York Fashion Week, Red Stiletto Media, runway. Bookmark the permalink.